The woolly mammoth was roughly the same size as modern African elephants. Males reached shoulder heights between 2.7 and 3.4 m (8.9 and 11.2 ft) and weighed up to 6 metric tons (6.6 short tons). Females reached 2.6–2.9 m (8.5–9.5 ft) in shoulder heights and weighed up to 4 metric tons (4.4 short tons). A newborn calf weighed about 90 kg (200 lb). The woolly mammoth was well adapted to the cold environment during the last ice age. It was covered in fur, with an outer covering of long guard hairs and a shorter undercoat. The colour of the coat varied from dark to light. The ears and tail were short to minimise frostbite and heat loss. 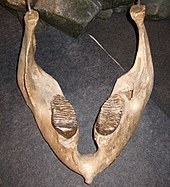 It had long, curved tusks and four molars, which were replaced six times during the lifetime of an individual. Its behaviour was similar to that of modern elephants, and it used its tusks and trunk for manipulating objects, fighting, and foraging. The diet of the woolly mammoth was mainly grasses and sedges. Individuals could probably reach the age of 60. Its habitat was the mammoth steppe, which stretched across northern Eurasia and North America. The woolly mammoth coexisted with early humans, who used its bones and tusks for making art, tools, and dwellings, and the species was also hunted for food. It disappeared from its mainland range at the end of the Pleistocene 10,000 years ago, most likely through climate change and consequent shrinkage of its habitat, hunting by humans, or a combination of the two. Isolated populations survived on St. Paul Island until 5,600 years ago and on Wrangel Island until 4,000 years ago. 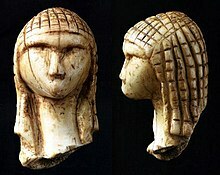 After its extinction, humans continued using its ivory as a raw material, a tradition that continues today. 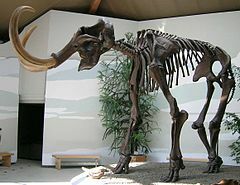 With a genome project for the mammoth completed in 2015,  it has been proposed the species could be recreated through various means, but none of these is yet feasible. 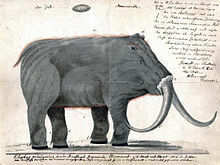 The " Adams mammoth" on exhibit in Vienna; skin can be seen on its head and feet. In April 2015, Swedish scientists published the complete genome ( nuclear DNA sequence) of the woolly mammoth. Several projects are working on gradually replacing the genes in elephant cells with mammoth genes. One such project is that of Harvard University geneticist George M. Church—who is funded by the Long Now Foundation,   which is attempting to create a mammoth–elephant hybrid using DNA from frozen mammoth carcasses. 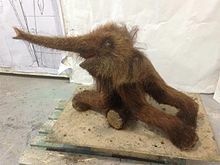 According to the researchers, a mammoth cannot be recreated, but they will try to eventually grow a hybrid elephant with some woolly mammoth traits in an "artificial womb". The Harvard University team is attempting to study the animals' characteristics in vitro by replacing or editing some specific mammoth genes into Asian elephant skin cells called fibroblasts that have the potential to become embryonic stem cells. By March 2015 and using the new CRISPR DNA editing technique, Church's team had some woolly mammoth genes edited into the genome of an Asian elephant; focusing on cold-resistance initially,  the target genes are for the external ear size, subcutaneous fat, hemoglobin, and hair attributes. By February 2017, Church's team had made 45 substitutions to the elephant genome. So far his work focuses solely on single cells. ^ Sloane, H. (1727–1728). 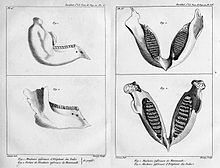 "An Account of Elephants Teeth and Bones Found under Ground". Philosophical Transactions. 35 (399–406): 457–471. Bibcode: 1727RSPT...35..457S. doi: 10.1098/rstl.1727.0042. ^ Sloane, H. (1727–1728). "Of Fossile Teeth and Bones of Elephants. Part the Second". Philosophical Transactions. 35 (399–406): 497–514. Bibcode: 1727RSPT...35..497S. doi: 10.1098/rstl.1727.0048. ^ Breyne, J. P.; s., T.; Wolochowicz, M. (1737). "A Letter from John Phil. Breyne, M. D. F. R. S. To Sir Hans Sloane, Bart. Pres. R. S. With Observations, and a Description of Some Mammoth's Bones Dug up in Siberia, Proving Them to Have Belonged to Elephants". Philosophical Transactions of the Royal Society of London. 40 (445–451): 124–138. doi: 10.1098/rstl.1737.0026. ^ Simpson, J. (2009). " Word Stories: Mammoth Archived 22 May 2013 at the Wayback Machine." Oxford English Dictionary Online, Oxford University Press. Accessed 5 June 2009. ^ a b Osborn, H. F. (1942). Percy, M. R. (ed.). Proboscidea: A monograph of the discovery, evolution, migration and extinction of the mastodonts and elephants of the world. 2. New York: J. Pierpont Morgan Fund. pp. 1116–1169. Archived from the original on 13 March 2016. ^ Maglio, V. J. (1973). "Origin and evolution of the Elephantidae". Transactions of the American Philosophical Society. 63 (3): 1–149. doi: 10.2307/1379357. JSTOR 1379357. ^ Shoshani, J.; Ferretti, M. P.; Lister, A. M.; Agenbroad, L. D.; Saegusa, H.; Mol, D.; Takahashi, K. (2007). "Relationships within the Elephantinae using hyoid characters". Quaternary International. 169–170: 174–185. Bibcode: 2007QuInt.169..174S. doi: 10.1016/j.quaint.2007.02.003. ^ Gross, L. (2006). "Reading the Evolutionary History of the Woolly Mammoth in Its Mitochondrial Genome". PLoS Biology. 4 (3): e74. doi: 10.1371/journal.pbio.0040074. PMC 1360100. PMID 20076539. ^ Roca, Alfred L.; Ishida, Yasuko; Brandt, Adam L.; Benjamin, Neal R.; Zhao, Kai; Georgiadis, Nicholas J. (2015). "Elephant Natural History: A Genomic Perspective". Annual Review of Animal Biosciences. 3 (1): 139–167. doi: 10.1146/annurev-animal-022114-110838. PMID 25493538. ^ Krause, J.; Dear, P. H.; Pollack, J. L.; Slatkin, M.; Spriggs, H.; Barnes, I.; Lister, A. M.; Ebersberger, I.; Pääbo, S.; Hofreiter, M. (2005). "Multiplex amplification of the mammoth mitochondrial genome and the evolution of Elephantidae". Nature. 439 (7077): 724–727. Bibcode: 2006Natur.439..724K. doi: 10.1038/nature04432. PMID 16362058. ^ Rohland, N.; Reich, D.; Mallick, S.; Meyer, M.; Green, R. E.; Georgiadis, N. J.; Roca, A. L.; Hofreiter, M. (2010). Penny, David (ed.). "Genomic DNA Sequences from Mastodon and Woolly Mammoth Reveal Deep Speciation of Forest and Savanna Elephants". PLoS Biology. 8 (12): e1000564. doi: 10.1371/journal.pbio.1000564. PMC 3006346. PMID 21203580. ^ Cappellini, E.; Jensen, L. J.; Szklarczyk, D.; Ginolhac, A. L.; Da Fonseca, R. A. R.; Stafford, T. W.; Holen, S. R.; Collins, M. J.; Orlando, L.; Willerslev, E.; Gilbert, M. T. P.; Olsen, J. V. (2012). "Proteomic analysis of a Pleistocene mammoth femur reveals more than one hundred ancient bone proteins". Journal of Proteome Research. 11 (2): 917–926. doi: 10.1021/pr200721u. PMID 22103443. ^ a b c Lister, A. M.; Sher, A. V.; Van Essen, H.; Wei, G. (2005). "The pattern and process of mammoth evolution in Eurasia". Quaternary International. 126–128: 49–64. Bibcode: 2005QuInt.126...49L. doi: 10.1016/j.quaint.2004.04.014. ^ Koehl, Dan (22 June 2018). "Elephant molar teeth". Absolut elephant. Retrieved 22 June 2018. ^ Enk, J.; Devault, A.; Debruyne, R.; King, C. E.; Treangen, T.; O'Rourke, D.; Salzberg, S. L.; Fisher, D.; MacPhee, R.; Poinar, H. (2011). "Complete Columbian mammoth mitogenome suggests interbreeding with woolly mammoths". Genome Biology. 12 (5): R51. doi: 10.1186/gb-2011-12-5-r51. PMC 3219973. PMID 21627792. ^ Lister, A. M.; Sher, A. V. (13 November 2015). "Evolution and dispersal of mammoths across the Northern Hemisphere". Science. 350 (6262): 805–809. Bibcode: 2015Sci...350..805L. doi: 10.1126/science.aac5660. PMID 26564853. ^ Vartanyan, S. L.; Arslanov, K. A.; Karhu, J. A.; Possnert, G. R.; Sulerzhitsky, L. D. (2008). "Collection of radiocarbon dates on the mammoths (Mammuthus primigenius) and other genera of Wrangel Island, northeast Siberia, Russia". Quaternary Research. 70 (1): 51–59. Bibcode: 2008QuRes..70...51V. doi: 10.1016/j.yqres.2008.03.005. ^ Den Ouden, N.; Reumer, J. W. F.; Van Den Hoek Ostende, L. W. (2012). "Did mammoth end up a lilliput? Temporal body size trends in Late Pleistocene Mammoths, Mammuthus primigenius (Blumenbach, 1799) inferred from dental data". Quaternary International. 255: 53–58. Bibcode: 2012QuInt.255...53D. doi: 10.1016/j.quaint.2011.07.038. ^ a b c Plotnikov, V. V.; Maschenko, E. N.; Pavlov, I. S.; Protopopov, A. V.; Boeskorov, G. G.; Petrova, E. A. (2015). "New data on trunk morphology in the woolly mammoth, Mammuthus primigenius (Blumenbach)". Paleontological Journal. 49 (2): 200–210. doi: 10.1134/S0031030115020070. ^ Valente, A. (1983). "Hair structure of the Woolly mammoth, Mammuthus primigenius and the modern elephants, Elephas maximus and Loxodonta africana". Journal of Zoology. 199 (2): 271–274. doi: 10.1111/j.1469-7998.1983.tb02095.x. ^ Repin, V. E.; Taranov, O. S.; Ryabchikova, E. I.; Tikhonov, A. N.; Pugachev, V. G. (2004). "Sebaceous Glands of the Woolly Mammoth, Mammothus primigenius Blum. : Histological Evidence". Doklady Biological Sciences. 398 (1–6): 382–384. doi: 10.1023/B:DOBS.0000046662.43270.66. PMID 15587793. ^ Rompler, H.; Rohland, N.; Lalueza-Fox, C.; Willerslev, E.; Kuznetsova, T.; Rabeder, G.; Bertranpetit, J.; Schöneberg, T.; Hofreiter, M. (2006). "Nuclear Gene Indicates Coat-Color Polymorphism in Mammoths" (PDF). Science. 313 (5783): 62. doi: 10.1126/science.1128994. PMID 16825562. ^ Workman, C.; Dalen, L.; Vartanyan, S.; Shapiro, B.; Kosintsev, P.; Sher, A.; Gotherstrom, A.; Barnes, I. (2011). "Population-level genotyping of coat colour polymorphism in woolly mammoth (Mammuthus primigenius)". Quaternary Science Reviews. 30 (17–18): 2304–2308. Bibcode: 2011QSRv...30.2304W. doi: 10.1016/j.quascirev.2010.08.020. ^ Tridico, Silvana R.; Rigby, Paul; Kirkbride, K. Paul; Haile, James; Bunce, Michael (2014). "Megafaunal split ends: microscopical characterisation of hair structure and function in extinct woolly mammoth and woolly rhino". Quaternary Science Reviews. 83: 68–75. Bibcode: 2014QSRv...83...68T. doi: 10.1016/j.quascirev.2013.10.032. Archived from the original on 2 November 2017. ^ a b McNeil, P.; Hills, L.; Kooyman, B.; Tolman, S. (2005). "Mammoth tracks indicate a declining Late Pleistocene population in southwestern Alberta, Canada". Quaternary Science Reviews. 24 (10–11): 1253–1259. Bibcode: 2005QSRv...24.1253M. doi: 10.1016/j.quascirev.2004.08.019. ^ Campbell, K. L.; Roberts, J. E. E.; Watson, L. N.; Stetefeld, J. R.; Sloan, A. M.; Signore, A. V.; Howatt, J. W.; Tame, J. R. H.; Rohland, N.; Shen, T. J.; Austin, J. J.; Hofreiter, M.; Ho, C.; Weber, R. E.; Cooper, A. (2010). "Substitutions in woolly mammoth hemoglobin confer biochemical properties adaptive for cold tolerance". Nature Genetics. 42 (6): 536–540. doi: 10.1038/ng.574. PMID 20436470. ^ Lynch, V.; Bedoya-Reina, O. C.; Ratan, A.; Sulak, M.; Drautz-Moses, D. I.; Perry, G. H.; Miller, W.; Schuster, S. C. (2015). "Elephantid genomes reveal the molecular bases of Woolly Mammoth adaptations to the arctic". Cell Reports. 12 (2): 217–228. doi: 10.1016/j.celrep.2015.06.027. PMID 26146078. ^ Bocherens, H.; Fizet, M.; Mariotti, A.; Gangloff, R. A.; Burns, J. A. (1994). "Contribution of isotopic biogeochemistry (13C,15N,18O) to the paleoecology of mammoths (Mammuthus primigenius)". Historical Biology. 7 (3): 187–202. doi: 10.1080/10292389409380453. ^ Van Geel, B.; Fisher, D. C.; Rountrey, A. N.; Van Arkel, J.; Duivenvoorden, J. F.; Nieman, A. M.; Van Reenen, G. B. A.; Tikhonov, A. N.; Buigues, B.; Gravendeel, B. (2011). "Palaeo-environmental and dietary analysis of intestinal contents of a mammoth calf (Yamal Peninsula, northwest Siberia)". Quaternary Science Reviews. 30 (27–28): 3935–3946. Bibcode: 2011QSRv...30.3935V. doi: 10.1016/j.quascirev.2011.10.009. ^ a b c d Fisher, D. C.; Tikhonov, A. N.; Kosintsev, P. A.; Rountrey, A. N.; Buigues, B.; Van Der Plicht, J. (2012). "Anatomy, death, and preservation of a woolly mammoth (Mammuthus primigenius) calf, Yamal Peninsula, northwest Siberia" (PDF). Quaternary International. 255: 94–105. Bibcode: 2012QuInt.255...94F. doi: 10.1016/j.quaint.2011.05.040. ^ Metcalfe, J. Z.; Longstaffe, F. J.; Zazula, G. D. (2010). "Nursing, weaning, and tooth development in woolly mammoths from Old Crow, Yukon, Canada: Implications for Pleistocene extinctions". Palaeogeography, Palaeoclimatology, Palaeoecology. 298 (3–4): 257–270. doi: 10.1016/j.palaeo.2010.09.032. ^ a b Rountrey, A. N.; Fisher, D. C.; Tikhonov, A. N.; Kosintsev, P. A.; Lazarev, P. A.; Boeskorov, G.; Buigues, B. (2012). "Early tooth development, gestation, and season of birth in mammoths". Quaternary International. 255: 196–205. Bibcode: 2012QuInt.255..196R. doi: 10.1016/j.quaint.2011.06.006. ^ Reumer, J. W. F.; Ten Broek, C. M. A.; Galis, F. (2014). "Extraordinary incidence of cervical ribs indicates vulnerable condition in Late Pleistocene mammoths". PeerJ. 2: e318. doi: 10.7717/peerj.318. PMC 3970796. PMID 24711969. ^ Willerslev, E.; Davison, J.; Moora, M.; Zobel, M.; Coissac, E.; Edwards, M. E.; Lorenzen, E. D.; Vestergård, M.; Gussarova, G.; Haile, J.; Craine, J.; Gielly, L.; Boessenkool, S.; Epp, L. S.; Pearman, P. B.; Cheddadi, R.; Murray, D.; Bråthen, K. A.; Yoccoz, N.; Binney, H.; Cruaud, C.; Wincker, P.; Goslar, T.; Alsos, I. G.; Bellemain, E.; Brysting, A. K.; Elven, R.; Sønstebø, J. R. H.; Murton, J.; et al. (2014). "Fifty thousand years of Arctic vegetation and megafaunal diet". Nature. 506 (7486): 47–51. Bibcode: 2014Natur.506...47W. doi: 10.1038/nature12921. PMID 24499916. ^ Takahashi, K.; Wei, G.; Uno, H.; Yoneda, M.; Jin, C.; Sun, C.; Zhang, S.; Zhong, B. (2007). "AMS 14C chronology of the world's southernmost woolly mammoth (Mammuthus primigenius Blum.)". Quaternary Science Reviews. 26 (7–8): 954–957. Bibcode: 2007QSRv...26..954T. doi: 10.1016/j.quascirev.2006.12.001. ^ Álvarez-Lao, D. J.; García, N. (2012). "Comparative revision of the Iberian woolly mammoth (Mammuthus primigenius) record into a European context". Quaternary Science Reviews. 32: 64–74. Bibcode: 2012QSRv...32...64A. doi: 10.1016/j.quascirev.2011.11.004. ^ Gilbert, M. T. P.; Drautz, D. I.; Lesk, A. M.; Ho, S. Y. W.; Qi, J.; Ratan, A.; Hsu, C. -H.; Sher, A.; Dalen, L.; Gotherstrom, A.; Tomsho, L. P.; Rendulic, S.; Packard, M.; Campos, P. F.; Kuznetsova, T. V.; Shidlovskiy, F.; Tikhonov, A.; Willerslev, E.; Iacumin, P.; Buigues, B.; Ericson, P. G. P.; Germonpre, M.; Kosintsev, P.; Nikolaev, V.; Nowak-Kemp, M.; Knight, J. R.; Irzyk, G. P.; Perbost, C. S.; Fredrikson, K. M.; Harkins, T. T. (2008). "Intraspecific phylogenetic analysis of Siberian woolly mammoths using complete mitochondrial genomes". Proceedings of the National Academy of Sciences. 105 (24): 8327–8332. Bibcode: 2008PNAS..105.8327G. doi: 10.1073/pnas.0802315105. PMC 2423413. PMID 18541911. ^ Szpak, P.; Gröcke, D. R.; Debruyne, R.; MacPhee, R. D. E.; Guthrie, R. D.; Froese, D.; Zazula, G. D.; Patterson, W. P.; Poinar, H. N. (2010). "Regional differences in bone collagen δ13C and δ15N of Pleistocene mammoths: Implications for paleoecology of the mammoth steppe". Palaeogeography, Palaeoclimatology, Palaeoecology. 286 (1–2): 88–96. doi: 10.1016/j.palaeo.2009.12.009. ^ Stuart, A. J. (2005). "The extinction of woolly mammoth (Mammuthus primigenius) and straight-tusked elephant (Palaeoloxodon antiquus) in Europe". Quaternary International. 126–128: 171–177. Bibcode: 2005QuInt.126..171S. doi: 10.1016/j.quaint.2004.04.021. ^ Debruyne, R.; Chu, G.; King, C. E.; Bos, K.; Kuch, M.; Schwarz, C.; Szpak, P.; Gröcke, D. R.; Matheus, P.; Zazula, G.; Guthrie, D.; Froese, D.; Buigues, B.; De Marliave, C.; Flemming, C.; Poinar, D.; Fisher, D.; Southon, J.; Tikhonov, A. N.; MacPhee, R. D. E.; Poinar, H. N. (2008). "Out of America: Ancient DNA Evidence for a New World Origin of Late Quaternary Woolly Mammoths". Current Biology. 18 (17): 1320–1326. doi: 10.1016/j.cub.2008.07.061. PMID 18771918. ^ a b Braun, I. M.; Palombo, M. R. (2012). "Mammuthus primigenius in the cave and portable art: An overview with a short account on the elephant fossil record in Southern Europe during the last glacial". Quaternary International. 276–277: 61–76. Bibcode: 2012QuInt.276...61B. doi: 10.1016/j.quaint.2012.07.010. ^ Demay, L.; Péan, S.; Patou-Mathis, M. (October 2012). "Mammoths used as food and building resources by Neanderthals: Zooarchaeological study applied to layer 4, Molodova I (Ukraine)" (PDF). Quaternary International. 276–277: 212–226. Bibcode: 2012QuInt.276..212D. doi: 10.1016/j.quaint.2011.11.019. ^ Mussi, M.; Villa, P. (2008). "Single carcass of Mammuthus primigenius with lithic artifacts in the Upper Pleistocene of northern Italy". Journal of Archaeological Science. 35 (9): 2606–2613. doi: 10.1016/j.jas.2008.04.014. ^ Nikolskiy, P.; Pitulko, V. (2013). "Evidence from the Yana Palaeolithic site, Arctic Siberia, yields clues to the riddle of mammoth hunting". Journal of Archaeological Science. 40 (12): 4189–4197. doi: 10.1016/j.jas.2013.05.020. ^ Overstreet, D. F.; Kolb, M. F. (2003). "Geoarchaeological contexts for Late Pleistocene archaeological sites with human-modified woolly mammoth remains in southeastern Wisconsin, U.S.A". Geoarchaeology. 18: 91–114. doi: 10.1002/gea.10052. ^ Joyce, D. J. (2006). 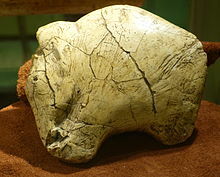 "Chronology and new research on the Schaefer mammoth (?Mammuthus primigenius) site, Kenosha County, Wisconsin, USA". Quaternary International. 142–143: 44–57. Bibcode: 2006QuInt.142...44J. doi: 10.1016/j.quaint.2005.03.004. ^ Stuart, A. J.; Sulerzhitsky, L. D.; Orlova, L. A.; Kuzmin, Y. V.; Lister, A. M. (2002). "The latest woolly mammoths (Mammuthus primigenius Blumenbach) in Europe and Asia: A review of the current evidence". Quaternary Science Reviews. 21 (14–15): 1559–1569. Bibcode: 2002QSRv...21.1559S. doi: 10.1016/S0277-3791(02)00026-4. ^ Dale Guthrie, R. (2004). "Radiocarbon evidence of mid-Holocene mammoths stranded on an Alaskan Bering Sea island". Nature. 429 (6993): 746–749. Bibcode: 2004Natur.429..746D. doi: 10.1038/nature02612. PMID 15201907. ^ a b Graham, R. W.; Belmecheri, S.; Choy, K.; Culleton, B. J.; Davies, L. J.; Froese, D.; Heintzman, P. D.; Hritz, C.; Kapp, J. D.; Newsom, L. A.; Rawcliffe, R.; Saulnier-Talbot, É.; Shapiro, B.; Wang, Y.; Williams, J. W.; Wooller, M. J. (1 August 2016). "Timing and causes of mid-Holocene mammoth extinction on St. Paul Island, Alaska". Proceedings of the National Academy of Sciences. 113 (33): 9310–4. doi: 10.1073/pnas.1604903113. PMC 4995940. PMID 27482085. ^ Stuart, A. J.; Kosintsev, P. A.; Higham, T. F. G.; Lister, A. M. (2004). "Pleistocene to Holocene extinction dynamics in giant deer and woolly mammoth". Nature. 431 (7009): 684–689. Bibcode: 2004Natur.431..684S. doi: 10.1038/nature02890. PMID 15470427. ^ a b c d e Nyström, V.; Humphrey, J.; Skoglund, P.; McKeown, N. J.; Vartanyan, S.; Shaw, P. W.; Lidén, K.; Jakobsson, M.; Barnes, I. A. N.; Angerbjörn, A.; Lister, A.; Dalén, L. (2012). "Microsatellite genotyping reveals end-Pleistocene decline in mammoth autosomal genetic variation". Molecular Ecology. 21 (14): 3391–3402. doi: 10.1111/j.1365-294X.2012.05525.x. PMID 22443459. ^ Palkopoulou, Eleftheria; Mallick, Swapan; Skoglund, Pontus; Enk, Jacob; Rohland, Nadin; Li, Heng; Omrak, Ayça; Vartanyan, Sergey; Poinar, Hendrik; Götherström, Anders; Reich, David; Dalén, Love (2015). "Complete Genomes Reveal Signatures of Demographic and Genetic Declines in the Woolly Mammoth". Current Biology. 25 (10): 1395–1400. doi: 10.1016/j.cub.2015.04.007. PMC 4439331. PMID 25913407. ^ Palkopoulou, E.; Mallick, S.; Skoglund, P.; Enk, J.; Rohland, N.; Li, H.; Omrak, A.; Vartanyan, S.; Poinar, H.; Götherström, A.; Reich, D.; Dalén, L. (23 April 2015). "Complete Genomes Reveal Signatures of Demographic and Genetic Declines in the Woolly Mammoth". Current Biology. 25 (10): 1395–1400. doi: 10.1016/j.cub.2015.04.007. PMC 4439331. PMID 25913407. ^ Nystrom, V.; Dalen, L.; Vartanyan, S.; Liden, K.; Ryman, N.; Angerbjorn, A. (2010). "Temporal genetic change in the last remaining population of woolly mammoth". Proceedings of the Royal Society B: Biological Sciences. 277 (1692): 2331–2337. doi: 10.1098/rspb.2010.0301. PMC 2894910. PMID 20356891. ^ Barsh, G. S.; Rogers, R. L.; Slatkin, M. (2 March 2017). "Excess of genomic defects in a woolly mammoth on Wrangel Island". PLOS Genetics. 13 (3): e1006601. doi: 10.1371/journal.pgen.1006601. PMC 5333797. PMID 28253255. ^ Switek, B. (2 March 2017). "Dying woolly mammoths were in 'genetic meltdown'". Nature. doi: 10.1038/nature.2017.21575. ^ a b Fiedel, Stuart (2009). "Sudden Deaths: The Chronology of Terminal Pleistocene Megafaunal Extinction". In Haynes, Gary (ed.). American Megafaunal Extinctions at the End of the Pleistocene. Vertebrate Paleobiology and Paleoanthropology. Springer. pp. 21–37. doi: 10.1007/978-1-4020-8793-6_2. ISBN 978-1-4020-8792-9. ^ Nogués-Bravo, D.; Rodríguez, J. S.; Hortal, J. N.; Batra, P.; Araújo, M. B. (2008). Barnosky, Anthony (ed.). "Climate Change, Humans, and the Extinction of the Woolly Mammoth". PLoS Biology. 6 (4): e79. doi: 10.1371/journal.pbio.0060079. PMC 2276529. PMID 18384234. ^ Sedwick, C. (2008). "What Killed the Woolly Mammoth?". PLoS Biology. 6 (4): e99. doi: 10.1371/journal.pbio.0060099. PMC 2276526. PMID 20076709. ^ Burney, D.; Flannery, T. (2005). "Fifty millennia of catastrophic extinctions after human contact" (PDF). Trends in Ecology & Evolution. 20 (7): 395–401. doi: 10.1016/j.tree.2005.04.022. PMID 16701402. Archived from the original (PDF) on 10 June 2010. ^ Doughty, C. E.; Wolf, A.; Field, C. B. (2010). "Biophysical feedbacks between the Pleistocene megafauna extinction and climate: the first human-induced global warming?". Geophysical Research Letters. 37 (15): L15703. Bibcode: 2010GeoRL..3715703D. doi: 10.1029/2010GL043985. ^ Vereshchagin, N. K. (2009). "The mammoth "cemeteries" of north-east Siberia". Polar Record. 17 (106): 3. doi: 10.1017/S0032247400031296. ^ a b Tolmachoff, I. P. (1929). "The carcasses of the mammoth and rhinoceros found in the frozen ground of Siberia". Transactions of the American Philosophical Society. 23 (1): 11–23. doi: 10.2307/1005437. JSTOR 1005437. ^ Farrand, W. R. (1961). "Frozen Mammoths and Modern Geology: The death of the giants can be explained as a hazard of tundra life, without evoking catastrophic events". Science. 133 (3455): 729–735. Bibcode: 1961Sci...133..729F. doi: 10.1126/science.133.3455.729. PMID 17777646. ^ Debruyne, R. G.; Barriel, V. R.; Tassy, P. (2003). "Mitochondrial cytochrome b of the Lyakhov mammoth (Proboscidea, Mammalia): New data and phylogenetic analyses of Elephantidae". Molecular Phylogenetics and Evolution. 26 (3): 421–434. doi: 10.1016/S1055-7903(02)00292-0. PMID 12644401. ^ Kosintsev, P. A.; Lapteva, E. G.; Trofimova, S. S.; Zanina, O. G.; Tikhonov, A. N.; Van Der Plicht, J. (2012). "Environmental reconstruction inferred from the intestinal contents of the Yamal baby mammoth Lyuba (Mammuthus primigenius Blumenbach, 1799)" (PDF). Quaternary International. 255: 231–238. Bibcode: 2012QuInt.255..231K. doi: 10.1016/j.quaint.2011.03.027. ^ Fisher, Daniel C. (2014). "X-ray computed tomography of two mammoth calf mummies". Journal of Paleontology. 88 (4): 664–675. doi: 10.1666/13-092. ^ Mashchenko, E. N.; Protopopov, A. V.; Plotnikov, V. V.; Pavlov, I. S. (2013). "Specific characters of the mammoth calf (Mammuthus primigenius) from the Khroma River (Yakutia)". Biology Bulletin. 40 (7): 626–641. doi: 10.1134/S1062359013070042. ^ Wong, K. (2013). "Can a mammoth carcass really preserve flowing blood and possibly live cells?". Nature. doi: 10.1038/nature.2013.13103. ^ a b Kruglova, Lidia (2 May 2011). "Pleistocene Park: so far without mammoths". The Voice of Russia. Archived from the original on 8 October 2017. Retrieved 5 March 2019. ^ Dalén, Love; Palkopoulou, Eleftheria; Mallick, Swapan; et al. (18 May 2015). "Complete Genomes Reveal Signatures of Demographic and Genetic Declines in the Woolly Mammoth". Current Biology. 25 (10): 1395–1400. doi: 10.1016/j.cub.2015.04.007. PMC 4439331. PMID 25913407. Retrieved 7 October 2017. ^ a b The Long Now Fouldation – Revive and Restore Archived 24 April 2015 at the Wayback Machine. ^ Kaebnick, Gregory E.; Jennings, Bruce (2017). "De-extinction and Conservation". Hastings Center Report. 47: S2–S4. doi: 10.1002/hast.744. PMID 28746761. ^ a b Webster, Ben (23 March 2015). "Scientist takes mammoth-cloning a step closer". The Sunday Times. ^ Scientists Hoped to Have Cloned a Living Woolly Mammoth by Now — Why Haven't We? Archived 8 October 2017 at the Wayback Machine. Sveta McShane. 17 August 2016. Singularity Hub. ^ "Scientists Sequence Woolly-Mammoth Genome". Mammoth Genome Project. Pennsylvania State University. Archived from the original on 2 December 2008. Retrieved 6 November 2014. ^ Zimov, S. A. (2005). "Essays on Science and Society: Pleistocene Park: Return of the Mammoth's Ecosystem". Science. 308 (5723): 796–798. doi: 10.1126/science.1113442. PMID 15879196. ^ Loi, Pasqualino; Saragusty, Joseph; Ptak, Grazyna (2014). Cloning the Mammoth: A Complicated Task or Just a Dream?. Adv Exp Med Biol. Advances in Experimental Medicine and Biology. 753. pp. 489–502. doi: 10.1007/978-1-4939-0820-2_19. ISBN 978-1-4939-0819-6. PMID 25091921. ^ Patkanov, S. (1897), Die lrtysch-Ostjaken und ihre Volkspoesie, I, St. Petersburg: St. Petersburg, pp. 123–124 [ permanent dead link]. (Here the belief is attested among the Khanty people of the Irtysh River basin). ^ a b Strong, W. D. (1934). "North American Indian traditions suggesting a knowledge of the mammoth". American Anthropologist. 36: 81–88. doi: 10.1525/aa.1934.36.1.02a00060.